October 21st, 2014 | Packing Tips. Few things are more stressful during a move than packing the items in your kitchen. Delicate stemware, bulky pots and pans and an over abundance of Tupperware are difficult to box up without breaking a few plates along the way. So what can you do to keep your kitchen ware safe before your next adventure? These tips and tricks will start you on the right track. Cups, goblets, stemware and sundae glasses have awkward shapes and are easy to break, especially if they’re made of glass or fine crystal. To keep your glasses from chipping, use a divided box designed for shipping wine and liquor bottles. If you can’t find a divided box, carefully line a small box with bubble-wrap to protect your glasses. Once you’ve found the right box, grab your largest and widest cup and lightly line the outside and inside with newspaper or packing paper. This reinforces the glass sides. Repeat the lining process with your second cup, and then place it inside the first cup. Continue placing each glass inside the ones before it until you can’t insert anymore (you’ll likely fit three or four glasses in each group before running out of room). As with cups and glasses, you can find cardboard boxes specifically for packing plates. These boxes, also known as dish packs, are stronger and thicker than the average cardboard box. This enables them to absorb shock and protect your dishes. Your local agent can provide dish packs at a competitive price. When you’re ready, put a plate on a sheet of newspaper. Place a thin sheet of bubble-wrap on the top of the plate. The bubble- wrap should be just big enough to cover the surface of the plate. Place the next plate on top, with another sheet of bubble-wrap. Repeat the process until you have three stacked plates, then use the newspaper to wrap the entire set. Seal the package with tape; then stack the wrapped plates on their side in the box(rather than stacking them flat). Pots and pans are sturdier than glassware, so you can use a generic large box to pack these items. Line the box with styrofoam packing peanuts, and you’ll be ready to pack. With pots and pans, you’ll want to use the same technique you used with your cups. Start with your largest pan (without its lid), and line it with newspaper or bubble-wrap. Then, nestle your smaller pan inside. When you’ve nested three pans together, use newsprint and packing paper to wrap the three together. Place the bunch in the bottom of the box and fill in the gaps with newspaper. If you have lids for your pans, wrap them individually and place them in the sides of the box. Mark the box as “Kitchenware” or “Pans” to help you stay organized. Because silverware and utensils are sturdy, you maybe tempted to toss them last minute in the bottom of another kitchen box. However, forks and knives have pointy, sharp edges that could injure you or your movers if handled incorrectly. 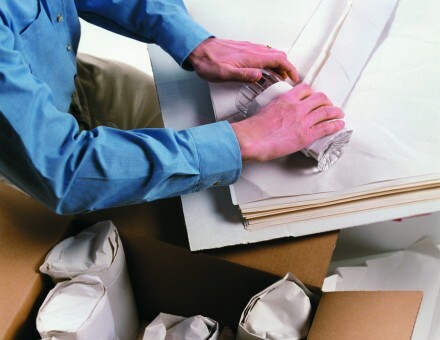 To prevent injury, roll forks and knives in tissue paper first before packing them away into a box. If your utensils are genuine silverware, do not wrap them in newsprint – this tarnishes your silverware. If your knives are part of a chopping block, use tape on all sides of the block to hold the knives in. Cover the entire block with packing paper, and mark the package as “knives” so you remember to handle them with care. Tupperware and other food storage containers stack easily and resist damage. Unlike other dishes, they don’t need a bubble-wrap lining because they are plastic. If you’ve acquired an extensive amount of Tupperware and similar containers over the years, they can add to the clutter of your move. To simplify the process, sort through and discard any items that you won’t need. Make sure each container has its own lid, and throw away any containers that are extensively stained or worn. Once you’ve decided what to keep, stack your containers in the same way you’d stack your cups: nest each small container in a large container (without their lids). Put the stacked Tupperware in the box, and then place their corresponding lids along the sides of the box. Of course, this is a lot of work. If this isn’t for you and you would like to have someone else do it for you, Bekins offers various packing services for your moving needs. Need Additional Advice? These tips and tricks will help you pack your kitchenware safely. For more household moving tips and tricks, don’t be afraid to ask your local Bekins agent for advice.